Manifestations of Stevens-Johnson syndrome include purpuric macules and targetoid lesions; full-thickness epidermal necrosis, although with lesser detachment of the cutaneous surface; and mucous membrane involvement. As with toxic epidermal necrolysis, medications are important inciting agents. If medications are the offending agent, symptoms may present within 4-28 days after exposure. In some cases, Mycoplasma infections may induce Stevens-Johnson syndrome or toxic epidermolysis syndrome, although it may present atypically with no skin lesions and only mucosal involvement, which is known as Fuchs syndrome. 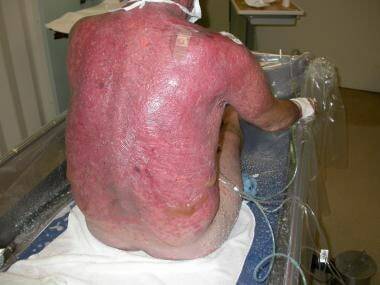 The mortality rate associated with Stevens-Johnson syndrome is much lower than the rate associated with toxic epidermal necrolysis, approaching 5% of cases. 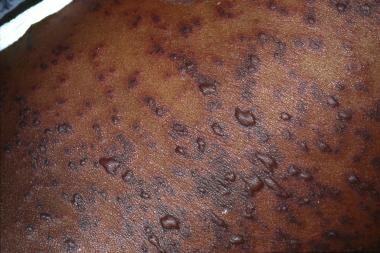 Note early cutaneous slough with areas of violaceous erythema. Extensive sloughing on the face. Extensive sloughing on the back. Together, Stevens-Johnson syndrome and toxic epidermal necrolysis may represent a spectrum of a single disease process. Stevens-Johnson syndrome may also have features of the dermatologic condition erythema multiforme (which has led to confusion in nosology). Constitutional symptoms, such as fever, anorexia, malaise, myalgias, cough, or sore throat, may appear 1-3 days prior to any cutaneous lesions. Patients may report a burning sensation in their eyes, photophobia, and a burning rash that begins symmetrically on the face and the upper part of the torso. Ocular symptoms present as the initial symptom in up to 45% of cases. Delineation of a drug exposure timeline is essential, especially in the 1-3 weeks preceding the cutaneous eruption. 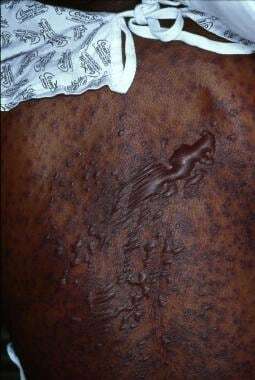 The initial skin lesions of Stevens-Johnson syndrome/toxic epidermal necrolysis are poorly defined, erythematous macules with darker, purpuric centers. The lesions differ from classic target lesions of erythema multiforme by having only two zones of color: a central, dusky purpura or a central bulla, with a surrounding macular erythema. A classic target lesion has three zones of color: a central, dusky purpura or a central bulla; a surrounding pale, edematous zone; and a surrounding macular erythema. See the image below. Note the presence of both 2-zoned atypical targetoid lesions and bullae. Lesions, with the exception of central bullae, are typically flat. (Lesions of erythema multiforme are more likely to be palpable.) Less frequently, the initial eruption may be scarlatiniform. See the image below. Extensive blistering and sloughing on the back. Nondenuded areas have a wrinkled paper appearance. A Nikolsky sign is easily demonstrated by applying lateral pressure to a bulla. 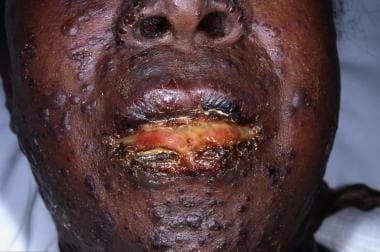 With regard to the arrangement of lesions, individual macules are found surrounding large areas of confluence. See the image below. Lesions begin symmetrically on the face and the upper part of the torso and extend rapidly, with maximal extension in 2-3 days. In some cases, maximal extension can occur rapidly over hours. Lesions may predominate in sun-exposed areas. Full detachment is more likely to occur in areas subjected to pressure, such as the shoulders, the sacrum, or the buttocks. Painful, edematous erythema may appear on the palms and the soles. The hairy scalp typically remains intact, but the entire epidermis, including the nail beds, may be affected. See the image below. Sheetlike desquamation on the foot in a patient with toxic epidermal necrolysis. Courtesy of Robert Schwartz, MD. A classification proposes that epidermal detachment in Stevens-Johnson syndrome is limited to less than 10% of the body surface area (BSA). Overlapping Stevens-Johnson syndrome/toxic epidermal necrolysis has more extensive confluence of erythematous and purpuric macules, leading to epidermal detachment of 10-30% of the BSA. Classic toxic epidermal necrolysis has epidermal detachment of more than 30%. An uncommon form of toxic epidermal necrolysis (toxic epidermal necrolysis without spots) lacks targetoid lesions, and blisters form on confluent erythema. Greater than 10% epidermal detachment is required for diagnosis of these cases. In contrast, bullous erythema multiforme, which was previously grouped with Stevens-Johnson syndrome, may have epidermal detachment of less than 10% of the BSA, but typical target lesions or raised atypical targets are localized primarily in an acral distribution. Areas of denuded epidermis in Stevens-Johnson syndrome/toxic epidermal necrolysis are dark red with an oozing surface. Mucous membrane involvement is present in nearly all patients and may precede skin lesions, appearing during the prodrome. A 2017 article in the American Journal of Dermatopathology discussed the presence of pseudomelanomas in a young man who developed Stevens-Johnson syndrome. Preexisting nevi prior to his illness were examined and none was deemed atypical. Several months after his discharge, three of his nevi clinically had changed and biopsy revealed a pseudomelanoma phenomenon in each nevus. Flaccid blisters are typically present with full-thickness epidermal necrosis, as shown in the slide below. Frozen sections usually show apoptotic keratinocytes throughout the entire epidermal layer, with lymphocytes and neutrophils in the epidermis. Separation of the epidermis from the dermis is apparent. Low-power view showing full-thickness epidermal necrosis. The use of intravenous immunoglobulin (IVIG) has been studied in the treatment of toxic epidermal necrolysis with mixed results. Viard et al suggested that keratinocyte apoptotic cell death occurs via activation of a cell-surface death receptor by Fas ligand (FasL). In vitro, target cell death was blocked by a receptor-ligand blocking antibody and by antibodies present in pooled human IVIG. An open trial of IVIG in 10 patients with toxic epidermal necrolysis resulted in a halt of progression within 24-48 hours, with no mortality. Subsequent studies in the early 2000s would substantiate this benefit. A review by French et al in 2006 highlighted eight studies, six of which demonstrated a benefit for IVIG. Analysis suggested a possible dose dependence with a trend towards a benefit for IVIG at doses larger than 2 g/kg on the mortality of toxic epidermal necrolysis. Given the potentially fatal nature of toxic epidermal necrolysis and the ethical issues involved, a randomized, controlled trial will likely never be performed. Given the suggestion of a therapeutic benefit, many centers are incorporating IVIG into their treatment protocols. An open study from the trauma literature demonstrated the efficacy of cyclosporine in the treatment of toxic epidermal necrolysis. 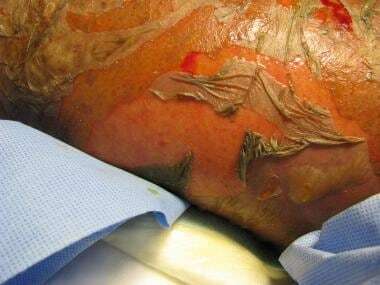 Arevalo et al presented 11 patients admitted consecutively to a burn unit, with toxic epidermal necrolysis involving a large BSA (83% ± 17%). Each patient received 3 mg/kg of cyclosporine daily, with the drug administered enterally every 12 hours. This group was compared to a series of six historical control subjects treated with cyclophosphamide and corticosteroids. In the study, the time from the onset of skin signs to arrest of disease progression and to complete reepithelialization was significantly shorter in the cyclosporine group. All patients in the cyclosporine group survived versus 50% surviving in the cyclophosphamide group. Given a mortality rate of approximately 30% in patients not infected with human immunodeficiency virus (HIV) with toxic epidermal necrolysis, cyclosporine may prove to be a life-saving therapy, but randomized, controlled trials are needed to make definitive recommendations. Mockenhaupt M. Stevens-Johnson syndrome and toxic epidermal necrolysis: clinical patterns, diagnostic considerations, etiology, and therapeutic management. Semin Cutan Med Surg. 2014 Mar. 33 (1):10-6. [Medline]. Halevy S, Ghislain PD, Mockenhaupt M, Fagot JP, Bouwes Bavinck JN, Sidoroff A. Allopurinol is the most common cause of Stevens-Johnson syndrome and toxic epidermal necrolysis in Europe and Israel. J Am Acad Dermatol. 2008 Jan. 58(1):25-32. [Medline]. Li K, Haber RM. Stevens-Johnson syndrome without skin lesions (Fuchs syndrome): a literature review of adult cases with Mycoplasma cause. Arch Dermatol. 2012 Aug. 148 (8):963-4. [Medline]. Okubo Y, Nochioka K, Testa MA. Nationwide Survey of Stevens-Johnson Syndrome and Toxic Epidermal Necrolysis in Children in the United States. Pediatr Dermatol. 2017 Mar. 34 (2):206-208. [Medline]. Garcia-Doval I, LeCleach L, Bocquet H, Otero XL, Roujeau JC. Toxic epidermal necrolysis and Stevens-Johnson syndrome: does early withdrawal of causative drugs decrease the risk of death?. Arch Dermatol. 2000 Mar. 136(3):323-7. [Medline]. Guegan S, Bastuji-Garin S, Poszepczynska-Guigne E, Roujeau JC, Revuz J. Performance of the SCORTEN during the first five days of hospitalization to predict the prognosis of epidermal necrolysis. J Invest Dermatol. 2006 Feb. 126(2):272-6. [Medline]. Chan F, Benson MD, Plemel DJA, Mahmood MN, Chan SM. A diagnosis of Stevens-Johnson Syndrome (SJS) in a patient presenting with superficial keratitis. Am J Ophthalmol Case Rep. 2018 Sep. 11:167-169. [Medline]. Lee HY, Walsh SA, Creamer D. Long-term complications of Stevens-Johnson syndrome/toxic epidermal necrolysis (SJS/TEN): the spectrum of chronic problems in patients who survive an episode of SJS/TEN necessitates multidisciplinary follow-up. Br J Dermatol. 2017 Oct. 177 (4):924-935. [Medline]. Ardakani NM, Tiwari SM, Wood BA. Pseudomelanomas Following Stevens-Johnson Syndrome. Am J Dermatopathol. 2017 Jul 26. [Medline]. Dodiuk-Gad RP, Chung WH, Valeyrie-Allanore L, Shear NH. Stevens-Johnson Syndrome and Toxic Epidermal Necrolysis: An Update. Am J Clin Dermatol. 2015 Dec. 16 (6):475-93. [Medline]. Viard I, Wehrli P, Bullani R, et al. Inhibition of toxic epidermal necrolysis by blockade of CD95 with human intravenous immunoglobulin. Science. 1998 Oct 16. 282(5388):490-3. [Medline]. French LE, Trent JT, Kerdel FA. Use of intravenous immunoglobulin in toxic epidermal necrolysis and Stevens-Johnson syndrome: our current understanding. Int Immunopharmacol. 2006 Apr. 6(4):543-9. [Medline]. Chung WH, Hung SI, Yang JY, Su SC, Huang SP, Wei CY, et al. Granulysin is a key mediator for disseminated keratinocyte death in Stevens-Johnson syndrome and toxic epidermal necrolysis. Nat Med. 2008 Dec. 14 (12):1343-50. [Medline]. Huang YC, Li YC, Chen TJ. The efficacy of intravenous immunoglobulin for the treatment of toxic epidermal necrolysis: a systematic review and meta-analysis. Br J Dermatol. 2012 Aug. 167 (2):424-32. [Medline]. Barron SJ, Del Vecchio MT, Aronoff SC. Intravenous immunoglobulin in the treatment of Stevens-Johnson syndrome and toxic epidermal necrolysis: a meta-analysis with meta-regression of observational studies. Int J Dermatol. 2015 Jan. 54 (1):108-15. [Medline]. Lee HY, Lim YL, Thirumoorthy T, Pang SM. The role of intravenous immunoglobulin in toxic epidermal necrolysis: a retrospective analysis of 64 patients managed in a specialized centre. Br J Dermatol. 2013 Dec. 169 (6):1304-9. [Medline]. Arevalo JM, Lorente JA, Gonzalez-Herrada C, Jimenez-Reyes J. 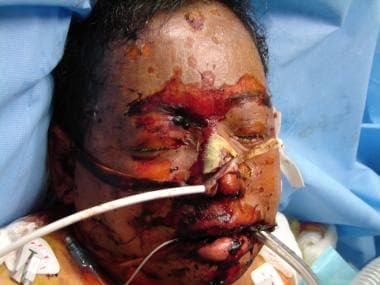 Treatment of toxic epidermal necrolysis with cyclosporin A. J Trauma. 2000 Mar. 48(3):473-8. [Medline]. Valeyrie-Allanore L, Wolkenstein P, Brochard L, Ortonne N, Maître B, Revuz J, et al. Open trial of ciclosporin treatment for Stevens-Johnson syndrome and toxic epidermal necrolysis. Br J Dermatol. 2010 Oct. 163 (4):847-53. [Medline]. Paradisi A, Abeni D, Bergamo F, Ricci F, Didona D, Didona B. Etanercept therapy for toxic epidermal necrolysis. J Am Acad Dermatol. 2014 Aug. 71 (2):278-83. [Medline]. Wolkenstein P, Latarjet J, Roujeau JC, et al. Randomised comparison of thalidomide versus placebo in toxic epidermal necrolysis. Lancet. 1998 Nov 14. 352(9140):1586-9. [Medline]. Castillo B, Vera N, Ortega-Loayza AG, Seminario-Vidal L. Wound care for Stevens-Johnson syndrome and toxic epidermal necrolysis. J Am Acad Dermatol. 2018 Oct. 79 (4):764-767.e1. [Medline]. Lee HY. 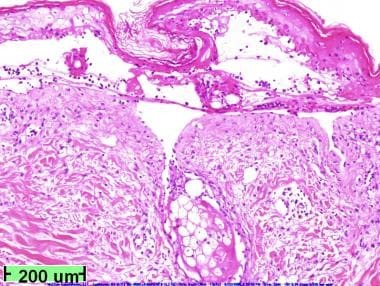 Wound management strategies in Stevens-Johnson syndrome/toxic epidermal necrolysis: An unmet need. J Am Acad Dermatol. 2018 Oct. 79 (4):e87-e88. [Medline].